Novak will travel across time zones at least 60 times this year. Novak Djokovic – The number one tennis player in the world and global traveler. Over the last 12 months, Novak Djokovic has played in 20 tournaments in 20 cities in 12 countries. Without his Astron GPS Solar chronograph, which we created especially for him last year, he would have had to adjust his watch manually more than 60 times. With his Astron, however, all he needs to do is to touch a button and see his watch adjust to the local time automatically. His schedule over the coming year looks just as challenging, so when Novak saw the new Astron Dual-Time series, it was a natural choice. It shares all the core advantages of his current Astron, but with a new caliber and a more simple dial design. The new Astron GPS Solar Novak Djokovic Limited Edition was born. 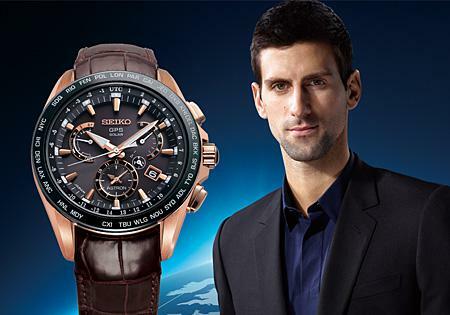 The Novak Djokovic Astron GPS Solar Dual-Time. Time travel made easy. Using just the power of light, every Astron GPS Solar watch connects to the GPS network and automatically adjusts, at the touch of a button, to every time zone on earth*, showing the time with a precision of one second every 100,000 years. Now, with the new Dual-Time caliber, you can read not only the time where you are, but also the time in your home time zone on a simple 12 hour sub-dial with a separate AM/PM indicator. In addition, the day of the week is displayed in a retrograde display at the 2 o’clock position, with the date at the 4 o’clock position. The date is correct every day until February 28, 2100. Thanks to the electronic setting function in the crown, the watch is simple to operate and a joy to wear. Global travel is stressful. Travel with Astron is a bit less so. If there are changes in the region / time zone, manual time zone selection may be required. 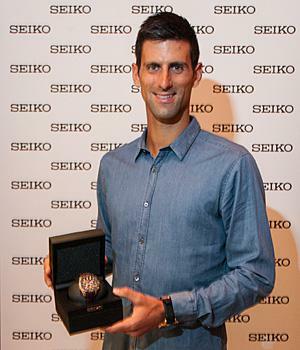 Novak received the very first Limited Edition Astron GPS Solar Dual-Time in New York. With a brown dial and crocodile leather strap, the rose-gold color highlights and the black ceramic bezel, the new Novak Djokovic Limited Edition combines sport and elegance in a way that makes the watch perfect for every aspect of Novak’s busy life. 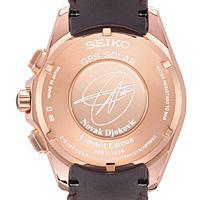 Each watch has its own individual serial number and carries Novak’s signature on the case back. The watch is offered in a special presentation box, with a card carrying a personal message from Novak. It will be released in autumn this year and presented at leading Seiko retail outlets worldwide. Seiko cannot help Novak to win tournaments, but we can help him manage his time in the most efficient way possible with this handsome new Astron creation.